As with many old roses mostly nobody knows the correct name for this beautiful crimson-purple rose, which is now known as ‘Charles de Mills’, although François Joyaux think’s it is the same as ‘Bizarre Triomphant’, one of the few Gallica roses from the 18th century. The strong fragrant lowers are large and lightly cup-shaped and filled with a multitude of small petals. 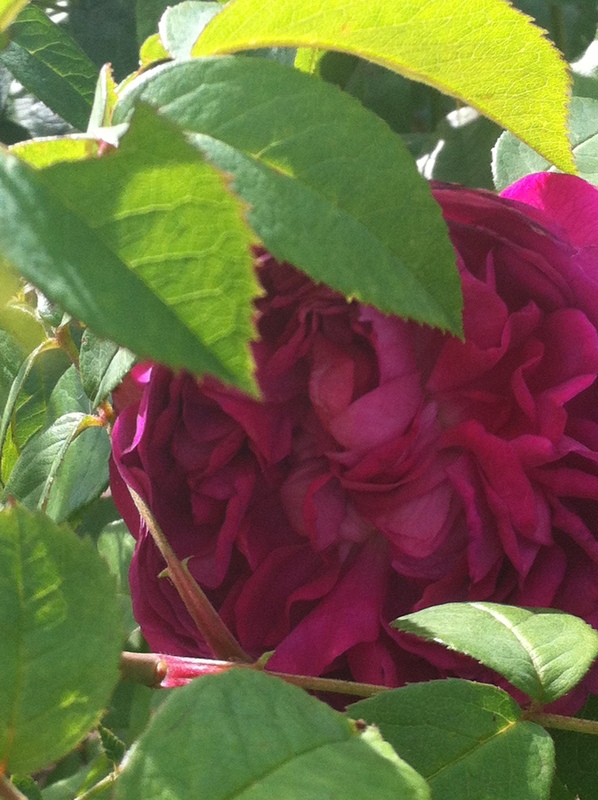 Sir Francis Bacon wrote about the Gallica roses “they are fast flowers of their smells’. In other words, the petals are retentive of scented oil, which of course makes them ideal for potpourri and for flavouring wines, preserves and confectionery. ‘Charles de Mills’ has a deeply floral and resinous fragrance, akin to retsina wine.In France ‘Charles de Mills’ was called ‘Bizarre Triomphant’ and it appeared -after it was introduced by François in 1790- 13 years later in the catalog of J.L.Descemet, who provided a large part of the rose collection of Empress Josephine. It is therefore not surprising that this rose later appeared in Vibert’s catalog of 1820. The rose acquired its current name in 1830, when there was indeed a breeder named Charles Mills Blyth in Nottinghamshire. Height of 39″ to 5′ (100 to 150 cm). Width of 4′ to 5′ (120 to 150 cm). I’ve planted ‘Charles de Mills’ in October 2008 in my first allotment and replanted her a year later when I was lucky to acquire another (larger) garden. Although lately I’m in doubt whether it is indeed ‘Charles de Mill’s that I have bought. This year I will try to find a “real” ‘Charles de Mills’ somewhere in bloom so that I can compare that rose with the one in my garden.